Instant downloads of all 946 LitChart PDFs (including Pygmalion). 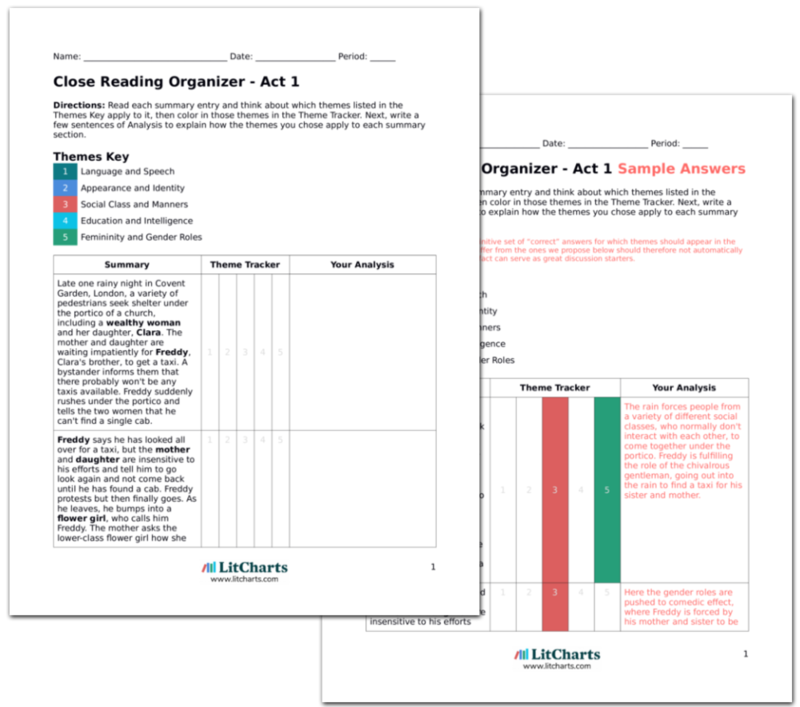 LitCharts assigns a color and icon to each theme in Pygmalion, which you can use to track the themes throughout the work. Higgins barges into his mother's home one afternoon. Mrs. Higgins is surprised to see her son and tells him to leave, as she is expecting friends to come visit. Higgins tells her he has found a woman, and she thinks he means romantically. He corrects her and tells her that he needs her help for "a phonetic job." Mrs. Higgins hopes that her son has found a romantic partner, but he is so consumed by his studies that he is only interested in women (and indeed people in general) as possible "phonetic job[s]." Higgins tells his mother about Eliza and says that she is to sit with Mrs. Higgins and her friends today and speak like a lady. Just as Higgins is preparing to leave, two of Mrs. Higgins' friends arrive: Mrs. and Miss Eynsford Hill, who turn out to be the mother and daughter from the first act. Higgins thinks he recognizes Clara, but doesn't remember from where. Colonel Pickering arrives. This is Eliza's first test, as she must converse with proper, ladylike manners among wealthy friends. Since the Eynsford Hills have seen her before (in Act One), it will be particularly telling to see if they can recognize the same flower girl underneath her new appearance. Freddy Eynsford Hill enters, and Higgins again thinks he looks familiar but can't remember why. He wonders what everyone will talk about until Eliza arrives, and Clara agrees that she hates small talk. She says she wishes people would say what they really think. Higgins disagrees and says that if he said what he really thought, "it wouldn't be decent." Clara is somewhat fed up with the manners and customs of high society, such as small talk. Higgins goes even further than her, implying that small talk and manners exist to cover up the indecent things that people really think. Higgins goes on to say that all people are really "savages, more or less," even though they're supposed to be civilized. Mrs. Higgins tells him to mind his manners, and just then Eliza arrives. Eliza behaves elegantly and politely, as she meets everyone. Mrs. Eynsford Hill thinks Eliza looks familiar. Again, Higgins thinks that manners cover up peoples' essentially savage nature. Mrs. Higgins criticism of Higgins shows that even saying such a thing is bad manners, but the tension between whether manners are just a way to look like a good person or actually are traits of a good person remains unresolved. So far, Eliza passes as an upper-class lady. Get the entire Pygmalion LitChart as a printable PDF. Higgins finally realizes where he knows the Eynsford Hills from. Everyone discusses the weather and Eliza begins to slip back into her lower-class speech habits. She makes the mistake of talking at length about her aunt's death, supposedly from influenza (though she suspects someone "done the old woman in."). At this point, Eliza's lower-class identity still shows through her upper-class appearance, revealed both through her speech (as in "done the old woman in") and lack of proper manners in talking about death at a party. To the shock of the other guests, Eliza describes her father's drinking habit. Not only is it an inappropriate topic of conversation, but she also slips back into her lower-class speech habits (including incorrect grammar). Freddy begins to laugh, seemingly fond of her, and Eliza asks if she has said anything she shouldn't have. Mrs. Higgins assures her she hasn't. She begins to speak again, but Higgins interrupts her, signaling that it is time for her to leave. Eliza does not yet fit in with Mrs. Higgins' upper-class guests, as shown by her lack of manners in speaking of inappropriate subjects and her unpolished language. And so Higgins cuts short this experiment, once again treating her like a subject rather than a person. After Eliza leaves, Mrs. Eynsford Hill is distressed over Eliza's manner of speaking, which Clara tells her is merely the new fashion. Mrs. Eynsford Hill still doesn't like it, and asks Pickering what he thinks. He says that he's been away in India, so is not up to date with correct manners. Clara says, "It's all a matter of habit. There's no right or wrong in it." The fact that Mrs. Eynsford Hill can believe that Eliza's way of speaking is the new fashion shows how artificial ideas of proper manners or ways of speaking are. As Clara perceptively says, such things are simply matters of habit, and not inherently right or wrong, proper or improper. Though contrast this with Higgins comments in Act One, when he says that Eliza's way of speaking is so ugly that she doesn't even deserve to live. The Eynsford Hills prepare to leave, and Higgins encourages Clara to try out the new fashion of speaking (Eliza's). Clara calls the Victorian obsession with manners "bloody nonsense," which shocks her mother. The Eynsford Hills leave, and Freddy says that he would like to meet Eliza again sometime. Clara is again fed up with the importance of proper manners. Freddy seems to like Eliza regardless of her social class or manners. As she leaves, Mrs. Eynsford Hill laments to Pickering that Clara is annoyed when she is not up to date with "the latest slang." Higgins asks his mother if Eliza was presentable, and Mrs. Higgins says she isn't. She says there is no hope of Eliza speaking properly if she is learning from Higgins, which mildly offends him. At this point, Eliza cannot yet pass for a wealthy lady. Mrs. Higgins hints that she won't be able to learn because Higgins himself has bad manners, again complicating whether manners are something that arise from social class or some kind of inner goodness or politeness. Mrs. Higgins asks about the state of Higgins' home, and learns that Higgins, Pickering, and Eliza are all living together now with Mrs. Pearce. Mrs. Higgins tells the two men that they are playing with a "live doll," but Higgins insists that he is doing a difficult job, transforming Eliza into "a quite different human being." Mrs. Higgins worries that her son is treating Eliza, a vulnerable young woman, like a plaything for his academic enjoyment. He now insists that his project is to entirely transform Eliza, not just to help her pretend to be someone she's not. Pickering assures Mrs. Higgins that they take Eliza very seriously, and Higgins calls her "the most absorbing experiment I ever tackled." The two talk about how quickly Eliza is picking up all of the things they are teaching her. Mrs. Higgins calls their attention to the problem of what to do with Eliza after their experiment. While Higgins and Pickering insist that they are treating Eliza well, Higgins refers to her merely as an "absorbing experiment." Only Mrs. Higgins thinks about Eliza's own feelings or issues when the experiment is finished. Mrs. Higgins says that Eliza will have all "the manners and habits that disqualify a fine lady from earning her own living," without the money to support such a lifestyle. But Pickering and Higgins aren't worried, and say they'll find her a job. They leave, laughing. Mrs. Higgins is upset, and exclaims, "Oh, men! men!! men!!!" Mrs. Higgins is smart enough, and compassionate enough, to realize the predicament that Eliza will find herself in post-experiment, caught between social classes. She is exasperated at the arrogance of Higgins and Pickering, who, as men, think that they know better than she does, but only cause problems. Fredericksen, Erik. "Pygmalion Act 3." LitCharts. LitCharts LLC, 15 Jan 2014. Web. 25 Apr 2019. Fredericksen, Erik. "Pygmalion Act 3." LitCharts LLC, January 15, 2014. Retrieved April 25, 2019. https://www.litcharts.com/lit/pygmalion/act-3.